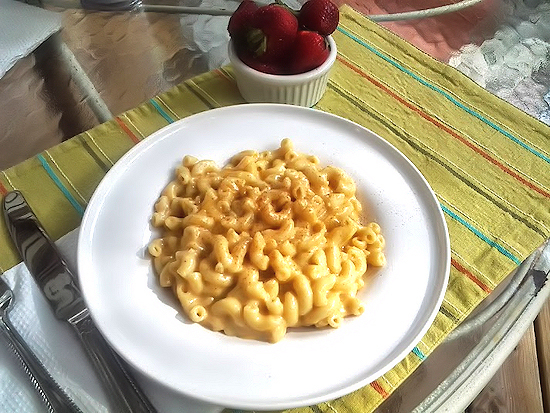 I love macaroni and cheese but I am not supposed to have a whole lot of pasta, so when I do, I always go for the Dreamfield’s pasta. You go for your favorite elbow pasta as I am going the traditional route today except for one thing! 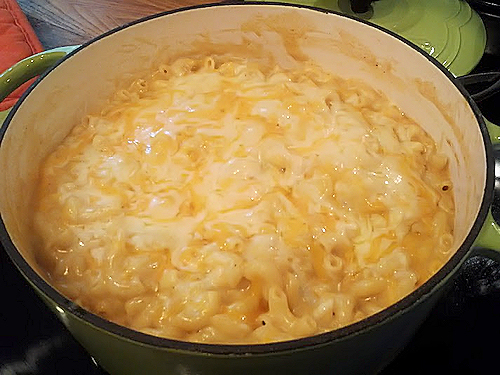 I never use egg, I want creamy not a casserole, so follow along to dreamy, creamy, cheesy pasta land with me! First thing you want to do is boil your water with a sprinkling of salt and get your pasta cooked and drained, then set aside. I used a large ceramic pot that goes from stove top to oven for this but you can certainly transfer it into a 9×13 baking dish when done. 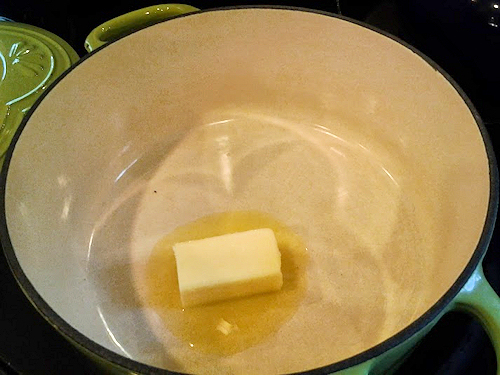 First, put 1/2 stick of butter in and throughly melt. Next you will start your rue. 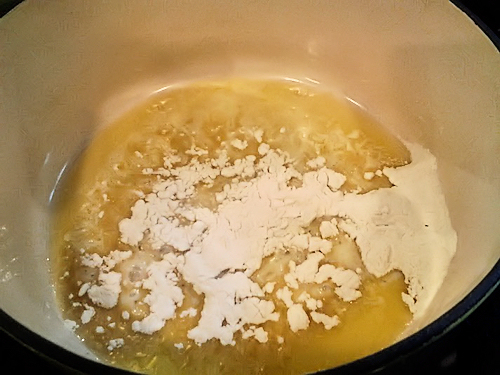 Add 1/4 cup flour into the melted butter. 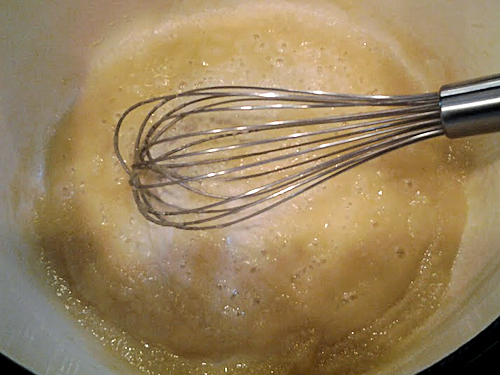 Whisk into a soft paste-like consistency. Now we are ready to add the milk one cup at a time, whisking in between each cup and getting throughly blended. Next we can add our spices in, the mustard, paprika, salt and pepper as well as the Dijon mustard. 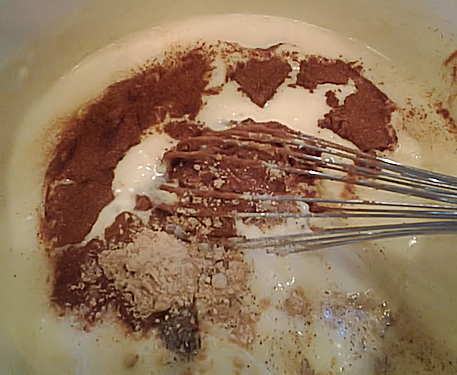 Whisk that in until blended and silky smooth. 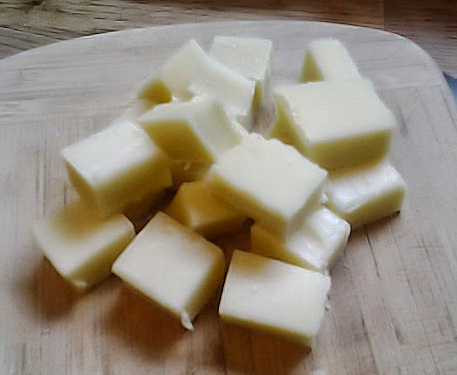 Cheese cubes were cut into about 1x1inch cubes so they melt nicely. 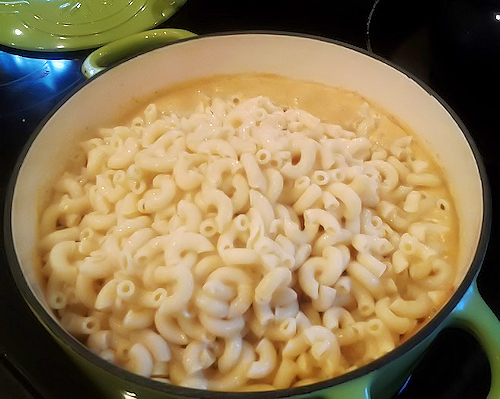 It is not time to add in all of our dreamy, creamy yummy cheese. Yes I love cheese, if someone said I could not have cheese anymore(?! )… well, we are not even going to contemplate that. 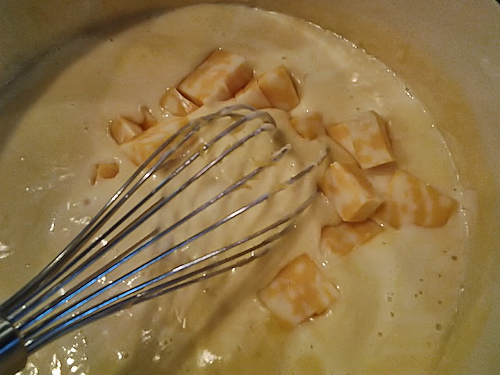 Add the 2 cups of shredded cheddar first and stir, then the cubes and stir with a wooden spoon or your favorite spatula whatever you like to use, but get it well blended. Oh, just look at it all melting! I am being watched and let’s just say I know the thought of adding beer at this point and just making soup is crossing his mind. Well forget it! 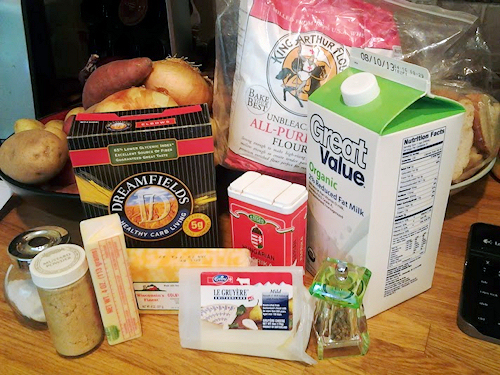 We are making Mac and Cheese! 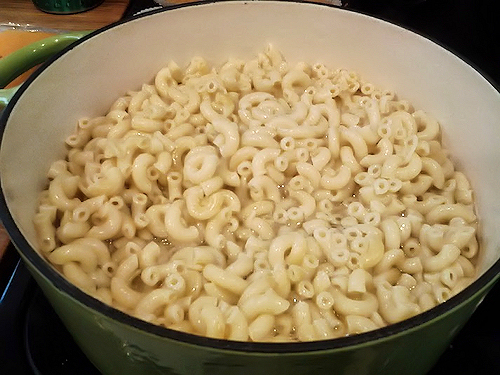 Once everything is creamy and smooth, we can add in the pasta that was set aside and should be well drained by now. 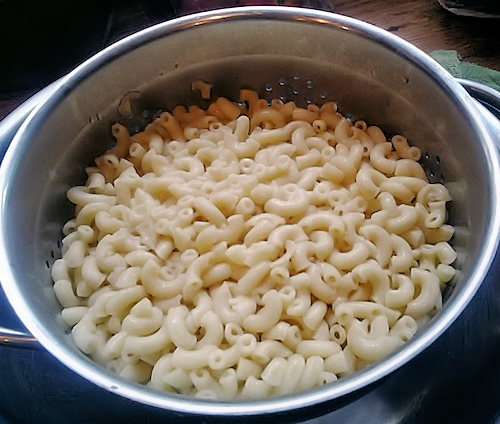 Dump right on top and stir in from top to bottom and side to side to get every noodle covered. Take that 1 Cup of Cheddar we reserved and sprinkle it all over the top. Place in an oven safe dish and set in the oven on 350 degrees for about 15min until the cheese on top gets nice and bubbly. You are ready to serve. 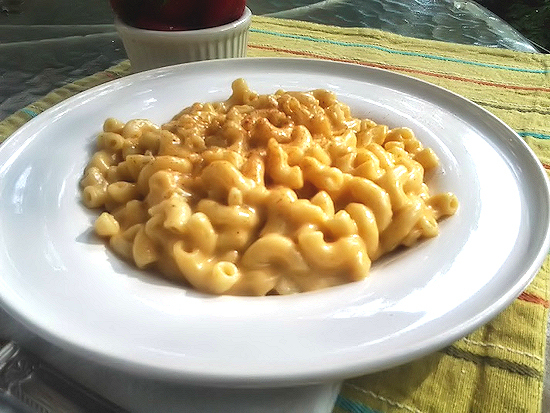 Just look at that cheese and since this has no eggs, I can guarantee you will love how creamy this is. 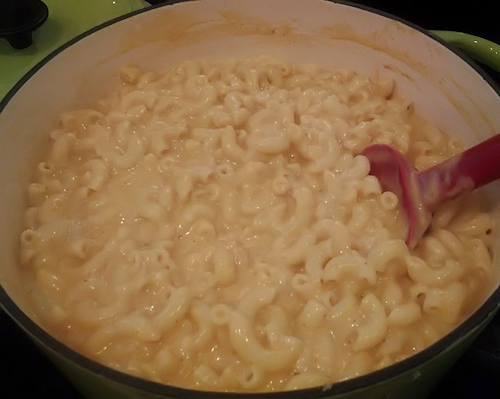 You won’t reach for the boxed mac-n-cheese again after you see just how easy this is. 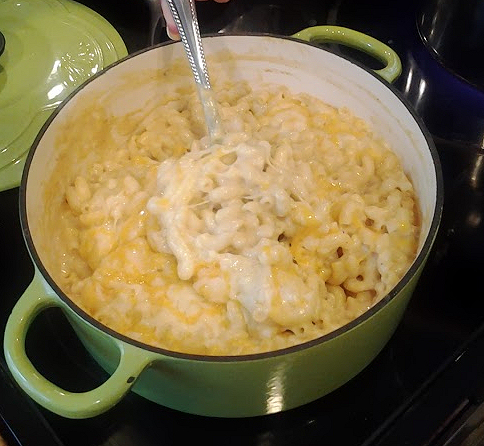 My daughter loves Mac and Cheese. It is her comfort food. 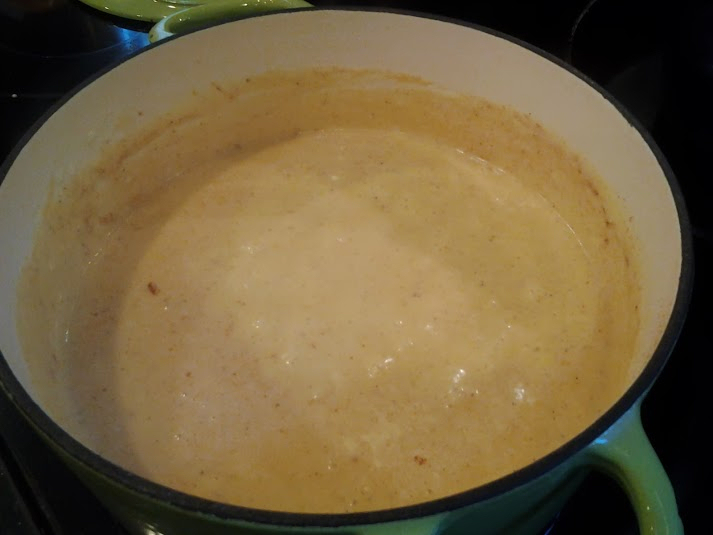 Sometimes we throw diced ham or fresh mushrooms in and sometimes SOME PEOPLE like bacon in it(Editor note: Only people who kick puppies don’t like bacon), but I just love creamy, cheesy, dreamy and simple. Enjoy!